Everyone who needs to deal with Static Electricity knows that personnel training and knowledge of the phenomena is the beginning for Static Protection. Protection against something which CAN NOT BE SEEN. But the most important issue is often overlooked; Detection and Measurement of STATIC FIELD. We buy equipment like wrist strap/heel strap testers, ESD mats, Lab-coats etc., and forget about the Static Field Checker or Meter. Often, the opinion is that this is an expensive extra. It is not. In reality, the tool to see and measure, to know the scale of danger of Static Electricity to be able to implement proportional to the danger preventive methods is just around the corner. 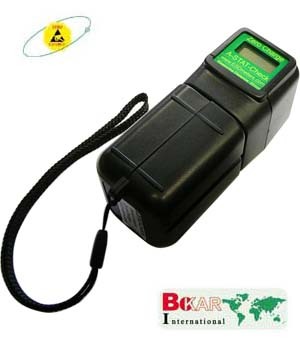 Bokar’s ZeroCharge A-STAT-Check Static Electricity Locator and Meter is the best priced Solution in the industry today, to see and measure Static Electricity. When we deal with other fields like weight, distance, no one can live without the tools to measure and use them several times each day. Why do we ignore STATIC ELECTRICITY detection and Measurement? It is time to correct it, and look for Distributor of ZeroCharge Brand in your Country. Buy A-STAT-Check and know exactly if there is a danger and how big it is.